SCD Group: Are Doing and Thinking Switchable Tasks for Association Executives? Are Doing and Thinking Switchable Tasks for Association Executives? I arranged for a non-profit CEO and a marketing agency chairman to meet and share ideas about a common marketing project for the non-profit. The non-profit is trying to decide whether to hire a marketing staffer or to contract with an agency. Both agreed that the challenge of a single marketing staffer comes down to hiring someone strategic (a thinker) or hiring someone to implement (a doer). And, they both feel that people are “wired” in one direction or the other but rarely both. 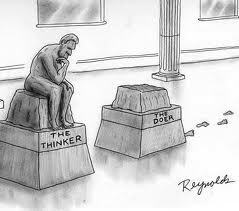 Doing versus thinking. Strategy versus tactics. Today vs tomorrow. These uses of time (and brain) challenge association executives daily. Especially if you are the CEO of a “small staff” association and don’t have the benefit of managing thinkers and doers. My main point is that we cannot multi-task most association functions. Most association executives “switch task” throughout the day: answering a phone call; responding to emails; conducting a staff meeting; participating in a board committee conference call; signing checks; reading professional journals; networking; etc. Each of these tasks force us to switch from what we were doing to what we now need to do. If you are focused mostly on doing and implementing, who in your organization is focused on strategic thinking? And, if you are more comfortable and focused on strategic thinking, who is doing the basic staff work at your association? Who is implementing your ideas? And, if you are trying to do both, how do you “compartmentalize” your thinking from your doing? Feel free to add your comments or thoughts. Especially if you are an exec in an association with a staff of five or less. Great question! In my experience, I've seen many nonprofit professionals try to juggle both, but frequently one side suffers. When I worked 'inside,' I used to outsource some the tactical work so I could keep my eye on the bigger picture, including the creative development. In small shops that can't afford to hire senior-level professionals, they can work with an external agency on the strategy and hire an a junior or mid-level employee to project manage the work. I've seen that work successfully. In fact, I recommended to my CEO friend that she contract with a senior level marketer (or agency) and hire a "junior-level" person who could focus on implementation.